Do you know the difference between content marketing for B2B (business-to-business) versus B2C (business-to-consumer)? 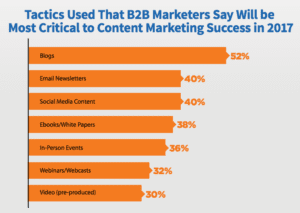 While B2B and B2C content marketing share a lot of common ground, B2B content typically focuses on informing and educating while B2C content focuses on inspiration. This is usually because a B2B purchase is based more on logic and a B2C purchase is based more on emotion. B2B companies face different challenges than B2C companies. 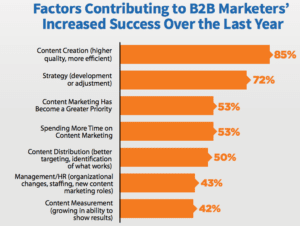 Research shows that 70% of B2B marketers are creating more content than they were the year before. 54% find it difficult to produce engaging content. Here are some content marketing tips for B2B for blogs, email, social and web. B2B companies that blog generate 67% more leads per month than those who don’t, according to HubSpot. Blogging is a great way of creating rich, original content for your audience to read. For B2B companies you may think a long boring article of an industry trend, but this doesn’t have to be the case. Although blogging is a great way of ramping up your content marketing, there are certain things to make sure you do and to make sure you don’t do. For starters, you’ll want to make sure you’re blogging on a consistent schedule, not sporadically; but blogs should also be of quality, not quantity. This is especially important with B2B, so you build a reliable and consistent fan base. Blogs that are too short run the risk of not resonating or not be able to communicate what you want to get across, so make sure your blogs are filled with detailed content containing 1,000+ words. Make sure you focus on user intent. Most of the people that read you’re blog are reading it for a purpose. That could be to get informed or educated or to try and put what they have learned into action. A good method to try is creating series pieces to drive repeat traffic. Incorporating call to actions, using numbers to demonstrate qualifiable results and leading content with key points and ending with takeaways are always good blogging strategies. Some ways of creating content that may interest your audience, even more, is by involving industry experts for credibility, or even using dialogue. You’ll also want to make your content readily shareable, so make sure to link your blog to various social media accounts. Believe it or not, LinkedIn is the most popular B2B social media platform, with 89% of B2B marketers using LinkedIn to share content, especially blog content. 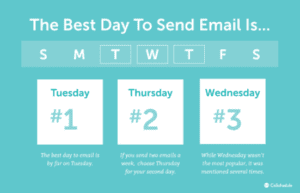 You’ll want to have a specific tool in place to create and manage your emails. Some great platforms are MailChimp, Litmus, Reach Mail and Target Hero. Email marketing brings in the highest overall ROI and it’s the best for generating leads. 74% of B2B marketers use a newsletter approach to reach out to their audience, according to Search Engine Journal. There are a lot of things to consider with email marketing. One of the most important is getting straight to the point or intention of the email; after you have done that you can give all the details. 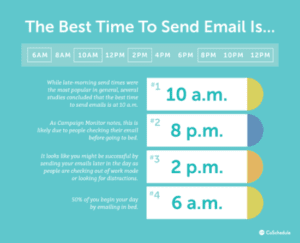 Email readers most likely are opening your email because they want they want to get useful information out of it. For B2B make sure your content is educating, informing, has thought leadership and delivering solutions to any problems they may have. According to Campaign Monitor, email on mobile devices is extremely important to take into consideration since 54% of people opening emails are doing it on their phones. You’ll also want to make sure your email is sent at the right time, most emails are generally opened Tuesday through Thursday with popular times being 10 am, 2 pm, 8 pm-midnight and 6 am. Don’t forget to continually optimize your subject lines, pre-header text, and link text for optimal open and click rates! For social you should evaluate your strategy, or create one if you haven’t already. You’ll want to stay organized by using a content calendar to plan and allocate a certain amount of posts per month. It’s smart to use user-generated content by sharing, reposting or retweeting; this is a way to have your customers feel recognized and appreciated on social. Hashtags are important because they can make it easier to find information with a theme or word. This will allow for highly specific audience targeting. You’ll also want to provide a seamless cohesive visual experience and tone across platforms. This will allow unity and better branding. It’s important to have engaging visuals or pictures in all of your social media content, that’s what will attract more people to your posts, which will, in turn, give you more likes, comments or shares. To name a few for B2B, your social media content should consist of company culture, recent industry articles or trends, services you provide and local news. Web content will want to be written with the B2B customer in mind. You can drive repeat customers by keeping your website up-to-date. Avoid needless repetition, but make sure to use a cohesive tone throughout web copy. Use short, concise paragraphs so the content is easier to read. Make sure to check and recheck for spelling or grammar errors! Don’t forget to format your text for the web and for mobile. Use “you” instead of “I” to connect more with your visitors. You’ll also want to make sure your web page has a sleek design, nothing too busy that will make them overwhelmed and wanting to leave the site. – Using social sharing buttons in posts that link to your social media. – Don’t let your content resemble an advertisement or promotion piece. – Learn the language of your customer so they can relate better. – Evaluate your competition, so you know what you can do better. – Communicate your value as a business. With all content marketing, you will want to develop a strategy. Write posts with original, genuine content and mix up your formats such as text, photos, infographics, videos, and micro-sites. Make sure your content is useful, engaging, and of high quality. The purpose of B2B content marketing is to educate and inform, so make sure you’re weaving that in throughout every platform. 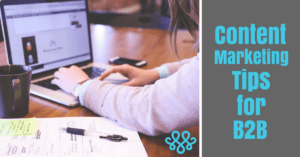 The benefits of content marketing can be highly beneficial to your company; it can expand your businesses audience, strengthen and develop a brand affinity, and ultimately drives leads and sales.